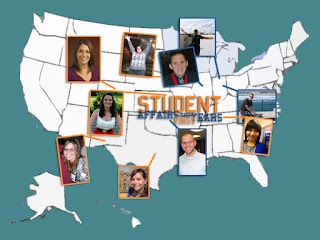 Student Affairs - the First Years is hoping to start a new movement talking about our own experiences as student affairs graduate students and professionals! We are prepared to bring you a post each day – excluding weekends. This blog will attempt to paint a picture of what the professional today looks like in Student Affairs. From work, life, and play in our field, we won’t necessarily be talking about students but who we are outside our jobs/ roles. Through conferences, networking associations, friends in the field, and mentors one hears and sees the successes, failures, and innovations that student affairs professionals are experiencing all over the country. Here’s to a new medium to capture our own stories. From one’s first job to one’s first conference presentation this blog will kick-start new conversations on the challenges, professional development, and student affairs highs/lows (everything is not perfect) that new professionals experience every day. To friends in student affairs and to graduate students fighting to survive, best of luck! The blog team is excited to bring our own stories to light. From all the writers of this blog, we welcome you! Feel free to share this with other professionals, colleagues, and graduate students within Student Affairs!